If someone were thawed today after being cryogenically frozen in late 2001, the only thing that would surprise them more than smartphones and President Donald Trump would be the existence of an eighth Fast and the Furious movie. “Wait, it’s an action movie now?” they’d ask. “Why is there no consistency in the titles? Isn’t The Rock a wrestler? People actually like these movies?” People really like them, actually. The feverish cult of fandom that’s erupted around the film is a testament to the fact that any franchise can be revived with a healthy dose of psychotic action and a co-starring role for Dwayne Johnson. And this exhaustive piece from Bloomberg would be a perfect primer for our recently thawed friend, as it painstakingly compiles the franchise’s stats across a number of different categories. “We counted just about everything that could be turned into a meaningful metric,” the piece says, “even screen time for men’s biceps.” (Apparently, 2 Fast 2 Furious had the most man-flesh, though nothing will top Johnson’s iconic flex from Furious 7). Other categories include “engine revving time” (2 Fast is again the winner), “mentions of family & team” (Fast & Furious 6 takes this one), and “Corona sips” (give that one to Fast & Furious). As a whole, the stats essentially tell the story of how the series rediscovered itself after shifting the focus from street racing to high-octane heists. That shift is also seen in this chart from Confused.com, which tallied every car that was wrecked in the making of these movies. While the first film totaled 78 cars, the most recent installment trashed 230 (and the sixth took out 350). 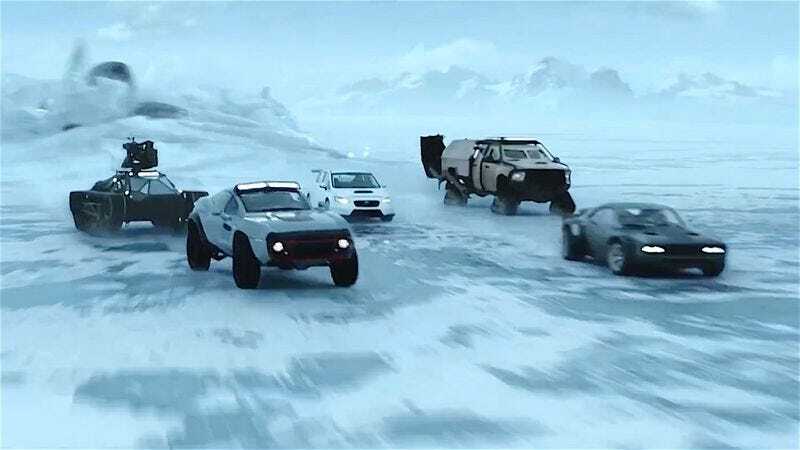 Furthermore, the trailer for Fate of the Furious features more wrecked cars than the entire first film, so there’s something to look forward to.